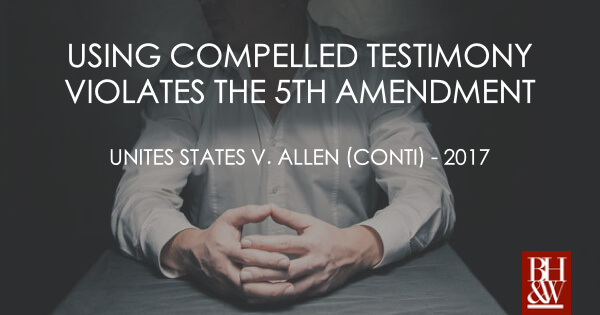 Is Use of Compelled Testimony of a Defendant in Trial a Violation of the Fifth Amendment Right Against Self Incrimination? The Second Circuit Court of Appeals recently handed down an opinion concerning the use of compelled testimony in an American trial. In Allen and Conti, the Court was asked to determine whether previous compelled testimony by a foreign government, which was later used against the defendant in a criminal prosecution in the United States, violated the Fifth Amendment. In 2013, both U.K. and U.S. law enforcement agencies began investigating wire fraud and bank fraud at the London office of Coöperative Centrale Raiffeisen-Boerenleenbank B.A. (“Rabobank”). Anthony Conti and Anthony Allen, previous employees of Rabobank in London as well as U.K. citizens and residents, were compelled to provide testimony during interviews with the U.K. agency, the Financial Conduct Authority (“FCA”). Although Conti and Allen were provided limited immunity from criminal prosecution, pursuant to U.K. law, refusing to testify would have resulted in imprisonment. The FCA pursued Conti and Allen’s coworker, Robson; however, without reason, the FCA dropped its case against Robson. Soon thereafter, the Fraud Section of the United States Department of Justice pursued criminal prosecution of Robson. Soon after Robson pled guilty, he became an integral cooperator of the investigation and a grand jury indicted Allen and Conti. During the 2015 trial, the government used the prior compelled testimony that Conti and Allen had given in the U.K. against them in the American trial. This resulted in convictions for both Conti and Allen with a year-and-a-day’s imprisonment and two years’ imprisonment respectively. Pursuant to Kastigar v. United States, 406 U.S. 441 (1972), the United States Government may compel testimony from an unwilling witness, who invokes the Fifth Amendment privilege against self-incrimination, by providing the witness immunity from use of the compelled testimony in subsequent criminal proceedings, as well as immunity from use of evidence derived from the testimony. During the FCA’s investigation of Robson, the FCA permitted Robson to review and take notes of Allen and Conti’s compelled testimony. Robson’s review of such testimony impacted his personal testimony, which was the sole source of Agent Weeks’ testimony. The District Court concluded looking to Second Circuit precedent, that Robson’s review of the defendants’ compelled testimony did not taint the evidence he later provided. On appeal, the defendant’s argued that the Government violated their Fifth Amendment rights when it used their own compelled testimony against them in the form of tainted evidence by Robson. The defendants specifically alleged that the Government applied the wrong legal standard in analyzing whether the evidence was tainted by Robson’s review of their compelled testimony. Every individual accused in an American criminal prosecution has a personal trial right to be free from self-incrimination as guaranteed by the Fifth Amendment. Use of compelled testimony against the accused during trial is a violation of this right, including when a foreign government, pursuant to its own law, compels such testimony. The Court exemplified that precedent shows that inculpatory statements obtained overseas must be made voluntarily. The Court explains that even if the testimony was lawfully compelled pursuant to the laws of a foreign power, the Fifth Amendment flatly prohibits the use of compelled testimony to secure a conviction, as it would be a violation of the right against self-incrimination. Further, when the government uses a witness who has been exposed to the compelled testimony of a defendant, it is required under Kastigar to prove, at a minimum, that this review did not alter or affect the evidence used by the government. Here, the prosecution used evidence of the defendant’s compelled testimony through a tainted witness who acted as an integral part of the prosecution’s investigation. Here, the court found that law enforcement officers in the U.K. undoubtedly compelled the defendant’s testimony. 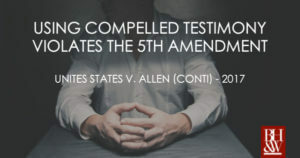 As a result, the court held that the Fifth Amendment prohibited the government from using the defendants’ compelled testimony—in any way—against them at trial in the United States.